The Vail Farmers’ Market & Art Show begins its 18th year with 135 vendors, including 40 food vendors. The market will last 17 Sundays throughout the summer, beginning June 17. VAIL — The Vail Farmers’ Market & Art Show kicks off its 18th summer season with more than 135 vendors of local produce, food and artisans on Sunday, June 17, and runs every Sunday through Oct. 7 on East Meadow Drive. 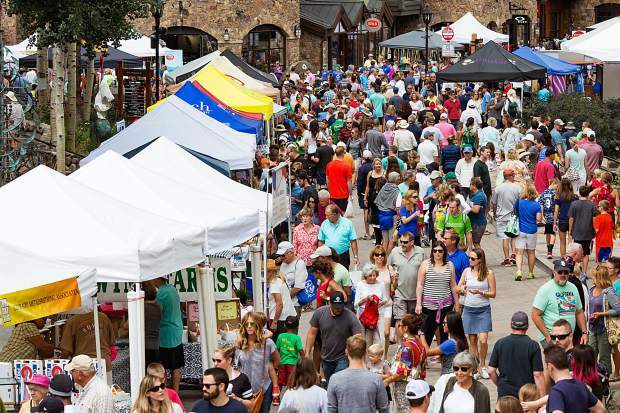 From fresh local produce, locally-sourced artisanal products, food vendors and live music, the farmers market is a celebration of summer in the Vail Valley. The Vail Farmers’ Market offers local fruits, vegetables and meats. Locals are welcome to start shopping for produce at 9:30 a.m. to receive the best selection. On June 17, expect to find farmers selling fresh cherries, tomatoes, summer squash, apricots, cucumbers, peas, arugula, kale, salad mix, onions garlic and new potatoes and more in-season fruits and vegetables including Colorado’s famous peaches will be coming soon. Bring your appetite on Sunday mornings also. With more than 40 food vendors, guests can sample the areas best food and enjoy a meal while browsing the market and enjoying the views of the Gore Range and the town of Vail.